Katie Hawley was a rising young soccer star when cancer hit at age 9. Now she balances a desire to be a “typical” teenager with the challenges of a life-threatening disease. At 18, Katie Hawley is such an expert at blending life as a teenager and life with cancer, she was consulted by producers of a new Netflix comedy series about a teen with leukemia. Yet she would happily give up that insider knowledge if she could. “I love going to Disneyland. I love hanging out with my friends,” she says, like any other teenager. But she’s been dealing with cancer since she was 9, when she was diagnosed with Stage 3 high-risk ganglioneuroblastoma. Neuroblastoma, the third most common cancer in children, develops in certain types of nerve tissue. Ganglioneuroblastomas have both malignant and benign cells. Children with non-high-risk neuroblastoma have a better than 95 percent chance of survival. Half of children are diagnosed “high risk”—and have a 50 percent survival rate. Since her diagnosis in July 2009, Katie has gone through multiple surgeries, chemotherapy sessions, radiation treatments and blood transfusions, and two experimental clinical trials. Her cancer has come back twice—at age 13 and 16— and she has beat it into remission, despite nausea, pain and hearing loss from treatments. “I honestly don’t know how I’ve done it,” Katie says. “Thankfully I am at an age where I understand everything my body can and cannot handle.” When she gets too tired, she takes her studies home. When things get really rough, she escapes to memories of her childhood “because it was so perfect,” says Katie. One of her favorite images: a soccer field in San Diego where she could see the ocean. That July, 9-year-old Katie was on her way to a game in San Diego when her stomach started hurting. “I threw up outside the car window,” she recalls. Her parents thought it might be a touch of flu, but the pain continued. At urgent care, an ultrasound showed a mass in Katie’s abdomen. Follow-up tests revealed devastating news: a tumor. A few days later, the family left their Ladera Ranch home for Children’s Hospital Los Angeles, one of the country’s leading centers for neuroblastoma treatment and research. CHLA is home to the New Approaches to Neuroblastoma Therapy (NANT) multi-institute consortium, the only consortium in the world dedicated to developing novel treatments and biomarkers for the cancer through early clinical trials. “It’s literally a race between us, the new science and the disease,” says Araz Marachelian, MD, MS, director of CHLA’s Neuroblastoma Program and Katie’s primary oncologist. Katie can’t remember her father telling her she had neuroblastoma. She can recall going into surgery. “I asked him, ‘Am I going to die?’” Surgeons removed the egg-sized tumor in her abdomen, as well as the right adrenal gland where the tumor was found and two cancerous lymph nodes. Katie spent fourth grade being home schooled. By December, after chemotherapy and radiation, the cancer was gone. Just over two years later, it came back. This time, it was also in her bones. Treatment started again at CHLA. In addition, Katie, then 13, went to University of California, San Francisco, for therapy with a medicine containing radioactive iodine. Later, she flew to New York for experimental chemotherapy. Both treatments had been arranged by her CHLA doctor. Katie went into remission, buoyed by friends, Disney movies and her faith. Entering high school, she joined the volleyball team. But her “maintenance” chemo—necessary to keep cancer in check—sapped her energy and she switched to dance. Her favorite subject was math and she started taking AP classes to prepare for college. Then, at 16, her world flipped upside-down again. On Christmas Day, Katie had terrible headaches. A few days later, scans at CHLA told the story: another relapse. This time, the cancer was outside her skull. “I wanted to give up,” says Katie, “even though there were countless other times I’ve said I was done.” She pictured herself running away to Paris with her boyfriend. As a teen, Katie had begun volunteering with the Jessie Rees Foundation, an organization dedicated to helping kids fight cancer. For her 18th birthday, Katie asked friends and family to donate to the Foundation and two other cancer charities in lieu of gifts. She and her mom started SOS—Stuff Our Slippers—a charity that gives slippers to kids in the hospital. “It’s important to give back,” Katie says. Through that work, she came to the attention of producers of the Netflix series, “Alexa and Katie.” (They had no idea that real-life Katie also has a close friend named Alexa.) Katie consulted on scripts, and in September 2017, filmed a scene in episode 8, in which she plays a member of a teen cancer support group. On set, there was a trailer with her name on it. “It was an amazing day I’ll never forget,” Katie says. This was an exciting moment in the life of a teen with cancer, which can be isolating. “I’ve lost friends along the way,” Katie says of fellow patients who haven’t survived. Some school friends have fallen by the wayside. She relies on a core group of BFFs and her close-knit family, which includes older sister, Melanie. In early February 2018, CHLA surgeons removed Katie’s thyroid to protect against suspected cancerous cells. By Feb. 21, Marachelian gave Katie the all-clear. She is officially in remission, but the challenges aren’t over. By mid-April, still recovering from thyroid surgery, she was back at CHLA to check in with an endocrinologist for low calcium levels. When she was younger, Katie thought she might want to be a pediatric nurse. “I love my nurses at CHLA,” she says. “They make me feel safe when I’m getting an extremely difficult treatment.” Now she says she’d rather not spend any more time in hospitals than necessary. 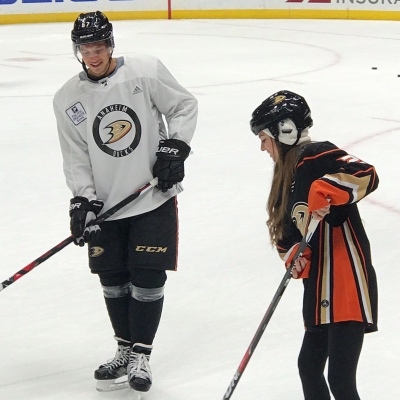 She is thinking of a career in communications, perhaps for an organization like Disney or the Anaheim Ducks—her favorite hockey team. To help kids like Katie, consider making a donation to Children's Hospital Los Angeles. Visit CHLA.org/Donate.